In a world where youth can alternatively be primary victims and/or perpetrators of violence, it is important to prepare them to better understand and deal with conflicts before they become violent and thus destructive. The ongoing tension and intolerance within our society reveal a persistent trend of conflict. The lack of reconciliation and the current political fragmentation created an environment of mistrust and hatred. This situation has deeply affected our community members and specifically our youth. Violence and clashes between groups from different communities is re-emerging. What can I do to make a change in my country called Lebanon? I started to ask this question when I realized the amount of problems that our new generation has inherited from the civil war that lasted more than 15 years. In a country which is composed of 18 religions and which is soaked in a serious political division, the possibility of change seems almost impossible. From my perspective, part of the solution lies in involving youth in diversity management, conflict transformation, peace building and human rights. Therefore, creating a dynamic of dialogue and mutual understanding amongst various youth became necessary and inevitable. Therefore, I decided to act! 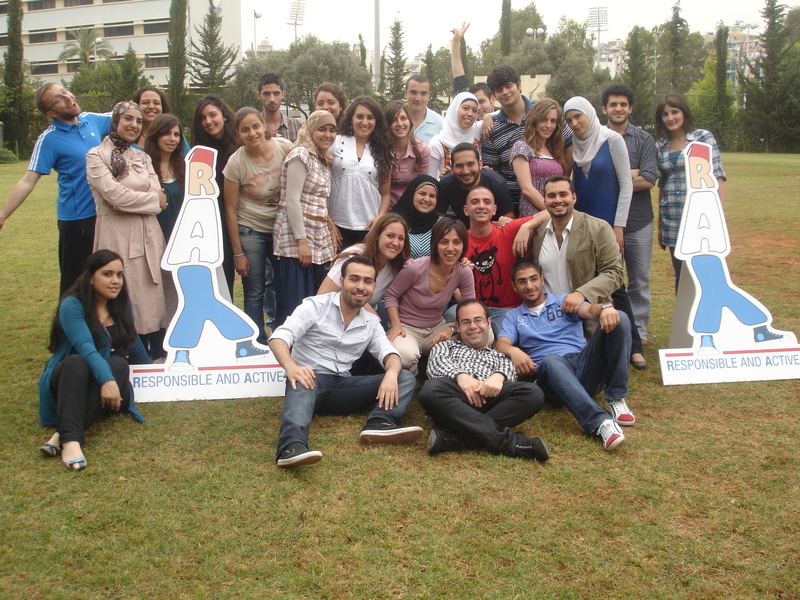 We gathered an amazing group, young, flexible, energetic and impressively positive in what became known as RAY: Responsible and Active Youth, a project aiming at mobilizing, empowering and providing youth with opportunities to learn about themselves and the other, then to get involved in working with their own communities through emphasizing constructive partnerships between both of them.. We were from different religions and Lebanese regions putting our efforts all together in order to create "something". We didn't know at the beginning what that "thing" could be, but we strongly wanted to make a change through it. We wanted that tool to be creative, youthful, alive, useful and practical. What could it be? After several meetings of brainstorming; with youth from different backgrounds, we finally found the answer: a GAME!! Yes, “LET’S TALK!” will be a game! As a team, we have always believed in the importance of learning through playing. Having fun was initially a golden rule in the RAY team! The RAY logo was created by the Core Volunteers. The traditional Lebanese hat “Tarboush” represents the Lebanese heritage and culture. The modern looking blue (jeans) trousers and the Converse shoes resemble the spirit of today’s youth. This mascot comes to remind us of the conflicts that sometimes occur along generation lines. RAY is designed to portray the dynamism of youth. 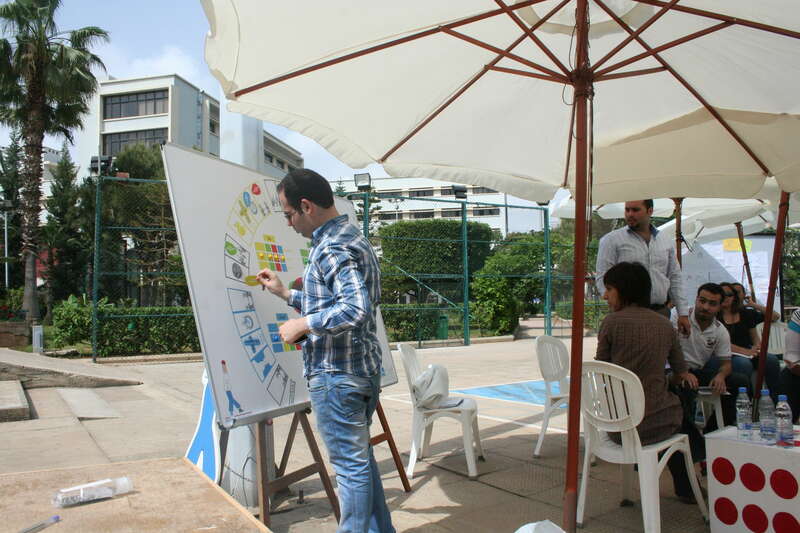 “Let’s talk “ or “ Ta’o Nehke” attempts to provide organizations and professionals, working with youth, with a spectrum of good practice and strategies on how to work with youth as partners ensuring full and equal participation. It also serves as a training tool aiming at empowering youth on how to constructively deal with inter-personal conflicts. “I learned through "let's talk" game how much it is important to know others’ feelings, perceptions and needs in a conflict", said one of the participants. Another one stated: "I didn't know that putting myself in others' shoes is so difficult, but it is amazing how it can positively affect the conflict". Hearing those success stories from the communities contributed in making one step towards Peace! Moreover, “Let’s talk” provides guiding principles on how to work with youth and to promote their role as agents of positive change within their communities by engaging them and helping them to take decisions and take the lead. “I realized after playing the game that "a conflict is an opportunity to make positive relationships as I learned as well the importance of taking off all the assumptions and prejudices in order to have Peace” stated one of the youth. Training youth on conflict transformation is merely the first step in their journey of becoming agents of peaceful change in their communities. This can be done when coupled with long-term involvement, direct work with youth, through coaching, providing opportunities to learn, arranging support needed, allowing spaces for practice, trial and error and deduction to reach the phase where youth are themselves empowered and can decide freely how and where to get involved. 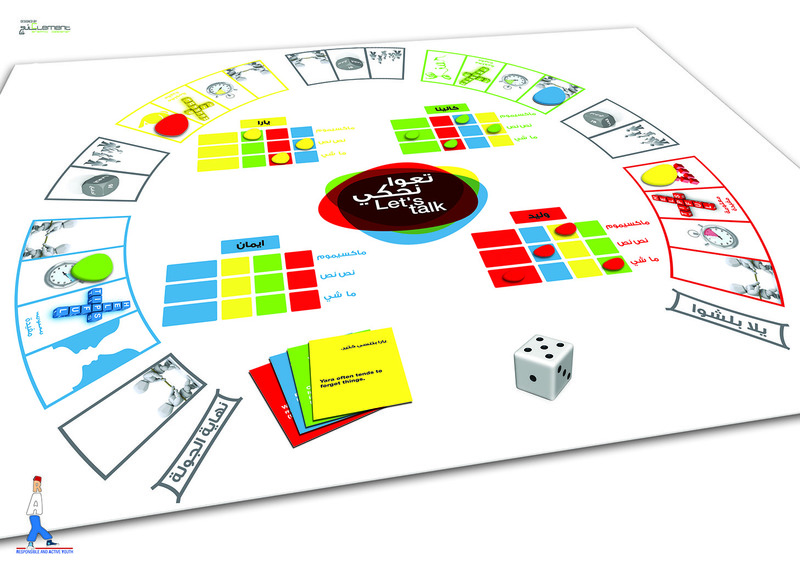 Basic overview of the RAY board game: “Let’s Talk” Through this game, players gain negotiation and communication skills and learn how to deal with conflicts positively. Four players go through a conflict scenario according to the role sheets that they receive. As they move by rolling the dice from one square to another, they deal with "tips" about other players, "perceptions", "negotiations", "time", “needs”, “empathy” – all important skills in conflict. “Ta’o Nehke” is designed to provide conflict-related knowledge, skills and attitudes to those playing it. What is unique in the “Let’s talk” board game? This game emphasizes the importance of relationships and relationship building. In “Ta’o Nehke”, players cannot achieve their objectives and win unless they make sure that they have built good relationships with other players. Who has ever played a game in which the villain is asked about his/her feelings and needs? This game brings the element of acknowledging that all players/characters have feelings and legitimate needs that should be heard and eventually met. 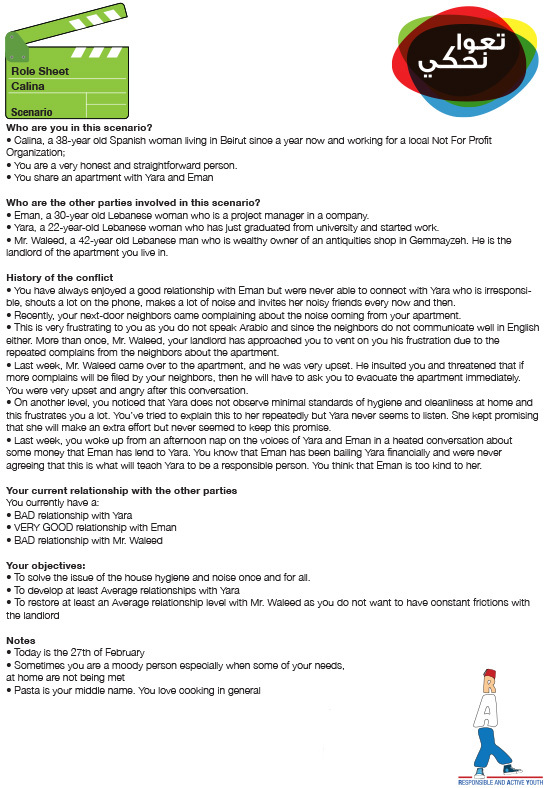 This game presents an opportunity for cooperation and building mutual and common grounds with other parties involved in the conflict. How many times has “Let’s Talk” been played and where? Before the starting date of the communities' actions, we selected seven volunteers from each community and gave them capacity building training and explained to them the process of playing the board game. They have also chosen a specific conflict taken directly from life in their communities and "played" it through the game. The conflicts were about a love story, gender discrimination and a problem between students and teacher. The 21 volunteers, trained and well-equipped, were excited more than us to get the feedback on the board game in their communities. Therefore, they played and disseminate "Let’s Ta!k" in their surroundings. Internationally, the game also was played in Malta with several youth coming from Spain, Lebanon, Palestine, Egypt, France and Malta. The discoveries we made during the preparation and during the training course, the feeling of growing and learning about something you have been denied, were so great that I felt the impulse to learn more. And now I have more comprehensive knowledge and a fighting spirit which, in a sense, drive me to carry on working towards a goal in which I believe. How can we provide opportunities for more young people to be trained in tolerance, acceptance of differences, and respect for diversity? How can we encourage and empower young people to be a part of change and promote their participation in society? Have YOU got an answer? What are YOU going to do? How can you acquire a copy of the board game? 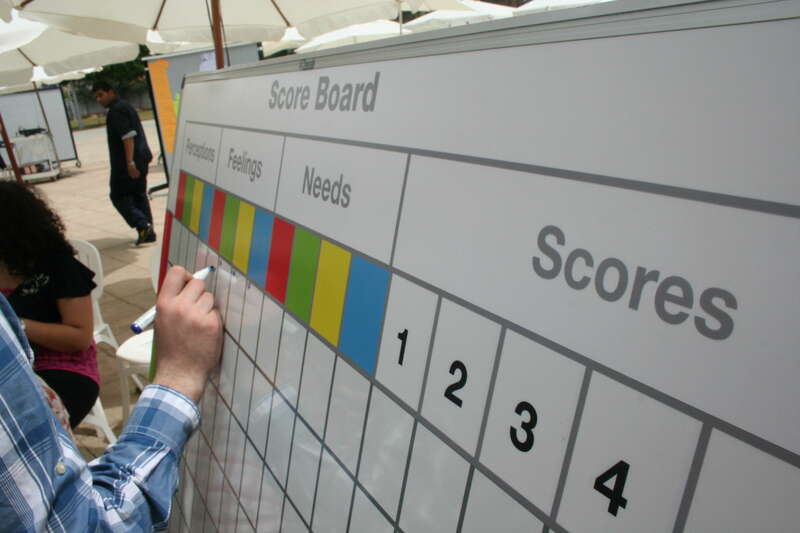 For trainers to receive a free copy of the board game, they should undergo training on the Toolkit and board game delivered by GIZ (Deutsche Gesellschaft für Internationale Zusammenarbeit (GIZ) GmbH/ www.giz.de. 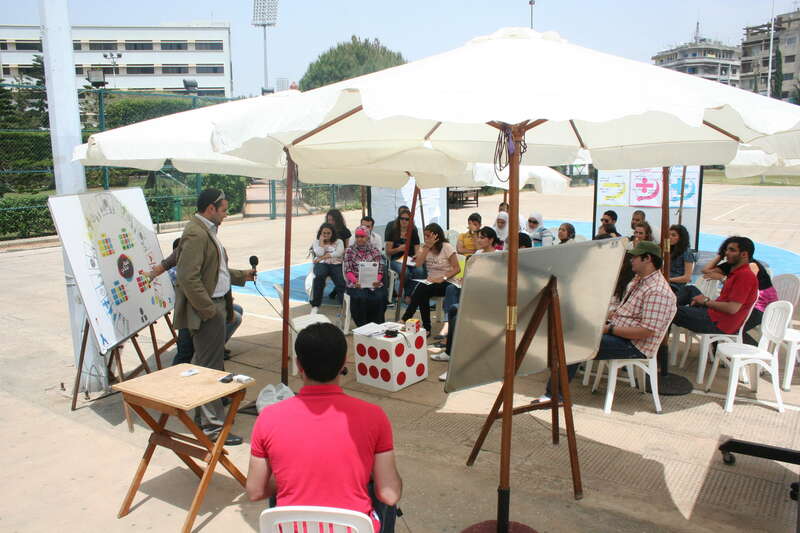 The board game was partly funded By GIZ Under the Civil Peace program in Lebanon) or ALEF (Association Libanaise pour l’Education et la Formation , local NGO working on Human Rights and advocacy who has implemented R.A.Y project). "Facilitate change and empower people to take ownership of their own sustainable development processes through a participatory and needs based approach" is a key element in Justine’s work. She is a Program officer for the civil peace program at GIZ – Lebanon. Trainer and Facilitator on Peace-building and Conflict Transformation for national and international organizations as well as representative for SALTO Youth Euromed.She also delivered training courses in different regions in Lebanon for Lebanese and Palestinians with World Vision, Search for Common Ground, OTI and the Arab Network for Human Rights & Citizenship Education. Internationally, she has provided trainings, coaching and mentoring for UNDP, UNFPA, YMCA- Ireland, Ministry of Youth- Tunisia, EU Delegation-Tunisia, Pax Christi- Holland. She has created tools on minority rights and conflict transformation.